One of the best amps I've ever had, style, tonality, and musicality, just perfect. There's no need to use the tone controls. The only weakness of E-212 is the lack of phono input, that's all. Surprising warmth from a solid-state amplifier. Sweet, enveloping, fluid and natural sound which you might readily mistake for a high-end tube amp were it not for the precision and clarity also on offer here. Capable of creating a truly wondrous yet intimate space in and around instruments and voices, locating and forming sonic images with consummate accuracy--yet with an alluring texture that will not fail to seduce you. Its calling card is not brute force but superlative agility and silky-smooth finesse. ....................... ....................... ....................... ....................... ....................... A full complement of inputs and controls, including four speaker outputs. Prodigious power output--rated conservatively 115wpc at 4ohms--and will run any speakers you may have with complete authority. Rock-solid build quality, and timeless aesthetics. This is one of the finest integrated amplifiers Accuphase has ever created, which is truly saying something. FWIW, I'm also partial to the Accuphase E-307 from the same era, as well as the more recent Luxman 505ux. If money is burning a hole in your pocket, there's the Accuphase E-460 as well. As with all Accuphase components, premium quality comes at a premium price. This unit listed at $3000 new and Accuphase components tend to hold their value remarkably well. Very detailed.Incredibly clear and transparent. This amplifier is fantastic but needs (compared with his big brothers) a little more musicality and sweetness. I change the E-212 amplifier for the E-407,but.... I think the E-407 have more power and better dinamics but the E-212 is absolutely clear,very detailed and very transparent.The E-407 is a little more musical but only a little.The E-407 is much better than the E-212 but this last (E-212) is a fantastic product. I remenber it. Immmensely clear sound. Great bass response. Beautiful styling: classical, symmetrical. Fantastic build quality - looks set to last 25 years! "unnecessary" (and unused) tone controls (although bypassable). Poor range of remote control. I enjoy listening to complex classical music but have found it hard to listen to - particularly Debussy, due to the complicated rhythmic patterns. When I had the opportunity to upgrade my amplifier, the ability to unravel complex musical structures was very high on my list. 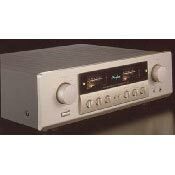 The Accuphase was a revelation - unlike every other amplifier at its price bracket I tested, it transmitted sound with clarity that literally allowed me to hear every individual note in Mitsuko Uchida's legendary recording of Debussy's Preludes. Needless to say, such abilities work across the musical spectrum from rock and pop to orchestral. The Accuphase provides an immensely satisfying musical experience that truly justifies it being the most expensive component in my hi-fi system, rewriting the traditional rules. My dealer says that people have traded in £8000 worth of Naim to buy an Accuphase; I went in the other direction, which is less financially harmful!